Care2 Healthy Living | Who Shouldn't Eat Soy? When the Women’s Health Initiative study found that menopausal women taking hormone replacement therapy suffered “higher rates of breast cancer, cardiovascular disease, and overall harm,” a call was made for safer alternatives. Yes, the Women’s Health Initiative found that estrogendoes have positive effects, such as reducing menopausal symptoms, improving bone health, and reducing hip fracture risk, but negative effects were also found, such as increasing the blood clots in the heart, brain, and lungs, as well as breast cancer. Ideally, to get the best of both worlds, we’d need what’s called a selective estrogen receptor modulator—something with pro-estrogenic effects in some tissues like bone but at the same time anti-estrogenic effects in other tissues like the breast. Drug companies are trying to make these, but phytoestrogens, which are natural compounds in plants, appear to function as natural selective estrogen receptor modulators. An example is genistein, which is found in soybeans, which happen to be structurally similar to estrogen. How could something that looks like estrogen act as an anti-estrogen? The original theory for how soy phytoestrogens control breast cancer growth is that they compete with our own estrogens for binding to the estrogen receptor. As more and more soy compounds are dripped onto breast cancer cells in a petri dish, less and less actual estrogen is able to bind to them. So, the estrogen-blocking ability of phytoestrogens can help explain their anti-estrogenic effects. How do we then explain their pro-estrogenic effects on other tissues like bone? How can soy have it both ways? The mystery was solved when it was discovered there are two different types of estrogen receptors in the body and the way in which a target cell responds depends on which type of estrogen receptor they have. The existence of this newly discovered estrogen receptor, named “estrogen receptor beta…to distinguish it from the ‘classical’ estrogen receptor alpha,” may be the “key to understanding the health-protective potential of soy” phytoestrogens. And, unlike our body’s own estrogen, soy phytoestrogens preferentially bind to the beta receptors. For instance, within eight hours or so of eating about a cup of cooked whole soybeans, genistein levels in the blood reach about 20 to 50 nanomoles. That’s how much is circulating throughout our body, bathing our cells. About half is bound up to proteins in the blood, so the effective concentration is about half the 20 to 50 nanomoles. What does that mean for estrogen receptor activation? In my video below, I feature a graph explaining the mysterious health benefits of soy foods. Around the effective levels we would get from eating a cup of soybeans, there is very little alpha activation, but lots of beta activation. What do we find when we look at where each of these receptors are located in the human body? The way estrogen pills increase the risk of fatal blood clots is by causing the liver to dump out extra clotting factors. But guess what? The human liver contains only alpha estrogen receptors, not beta receptors. So, perhaps eating 30 cups or so of soybeans a day could be a problem, but, at the kinds of concentrations we would get with just normal soy consumption, it’s no wonder this is a problem with drug estrogens but not soy phytoestrogens. The effects on the uterus also appear to be mediated solely by alpha receptors, which is presumably why no negative impact has been seen with soy. So, while estrogen-containing drugs may increase the risk of endometrial cancer up to ten-fold, phytoestrogen-containing foods are associated with significantly less endometrial cancer. In fact, protective effects are found for these types of gynecological cancers in general: Women who ate the most soy had 30 percent less endometrial cancer and appeared to cut their ovarian cancer risk nearly in half. Soy phytoestrogens don’t appear to have any effect on the lining of the uterus and can still dramatically improve some of the 11 most common menopausal symptoms (as compiled by the Kupperman Index). In terms of bone health, human bone cells carry beta estrogen receptors, so we might expect soy phytoestrogens to be protective. And, indeed, they do seem to “significantly increase bone mineral density,” which is consistent with population data suggesting that “[h]igh consumption of soy products is associated with increased bone mass…” But can soy phytoestrogens prevent bone loss over time? In a two-year study, soymilk was compared to a transdermal progesterone cream. The control group lost significant bone mineral density in their spine over the two years, but the progesterone group lost significantly less than that. The group drinking two glasses of soymilk a day, however, actually ended up even better than when they started. The main reason we care about bone mass is that we want to prevent fractures. Is soy food consumption associated with lower fracture risk? Yes. 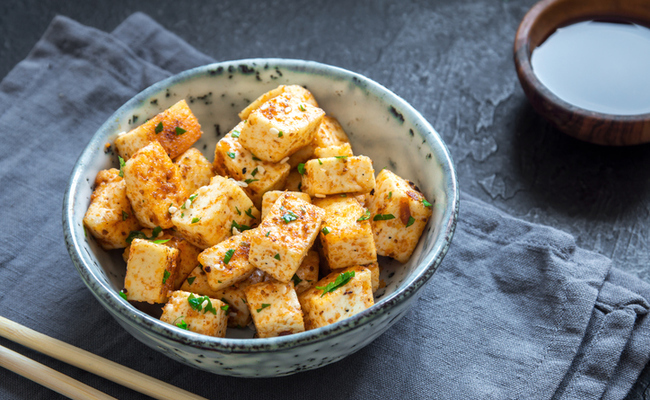 In fact, a significantly lower risk of bone fracture is associated with just a single serving of soy a day, the equivalent of 5 to 7 grams of soy protein or 20 to 30 milligrams of phytoestrogens, which is about a cup of soymilk or, even better, a serving of a whole soy food like tempeh, edamame, or the beans themselves. We don’t have fracture data on soy supplements, though. “If we seek to derive the types of health benefits we presume Asian populations get from eating whole and traditional soy foods,” maybe we should look to eating those rather than taking unproven protein powders or pills. Is there anyone who should avoid soy? Yes, if you have a soy allergy. That isn’t very common, though. A national survey found that only about 1 in 2,000 people report a soy allergy, which is 40 times less than the most common allergen, dairy milk, and about 10 times less than all the other common allergens, such as fish, eggs, shellfish, nuts, wheat, or peanuts. AHEM -- half of the pop. not mentioned -- for MEN, testosterone levels decrease over time. Eating high-estrogenic foods like soy for older men depresses testosterone levels further. OLDER MEN SHOULD AVOID SOY PRODUCTS. Nobody should eat Soy - Bayer formerly Monsanto has genetically modified it.